So, now you should be able to find some interesting shapes in the Mandelbrot set using orbit traps, but they look rather monochromatic at this point. There are several ways you can make the coloring more interesting, but those ways are more useful when you also employ region splits, and the most unique effects in Fractal Domains are achieved using region splits. So let’s proceed to learn about region splits. First, we need to understand the basic concept of regions in Fractal Domains. A region is a set of points in your image (not necessarily all connected) to which you can apply a color map. When there is more than one region, each region can be colored independently of the others. 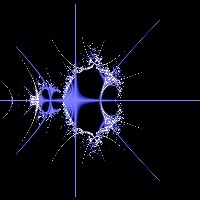 When you bring up a fresh fractal window there is only one region: the exterior of the Mandelbrot set. The interior of the Mandelbrot set is always colored black, and you could think of this as another region, but I don’t count it as a region because the coloring can’t be changed (in the current version of Fractal Domains, future version could change this). This menu is initially set to “Exterior.” Go up to the Palette menu and pick “All Black.” This sets the Exterior region, which we often think of as the background for purposes of making orbit trap images, to black. Now go to the Region menu in the Color Map Editor and select “Trap.” Now go to the Palette menu and select “Blue Gradient.” The Stalk region of the image is now colored with a blue gradient. Now select “Gray Gradient” in the Palette menu to put it back to its original color, which prepares us for the next step. We can introduce variety to our coloring scheme by dividing our image up into more regions, and coloring these regions separately. There are various ways of doing this. For the Trap region in particular there is a menu labeled “Regions Split” that controls how the Trap region is split up. 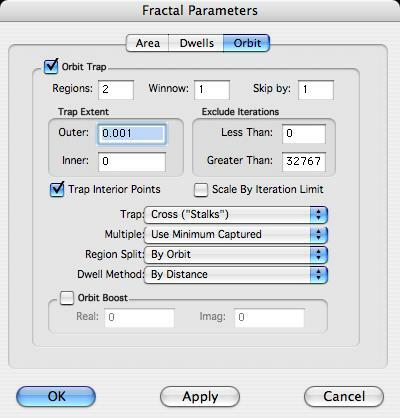 There is a field called “Regions” at the top of the Orbit dialog that works in conjunction with the Region Split menu; for some choices in Region Split, the Regions field determines how many regions the Trap region is split into. Let’s try the most basic choice in the Region Split menu. Open the Orbit Tab of the Parameters dialog and change the Region Split menu from “None” to “By Orbit” and click the “Apply” button (not the “OK” button — don’t close the Parameters dialog yet). Instead of one trap region, there are now two trap regions. Fractal Domains by default uses gray for the first region and blue for the second region. There are now three trap regions. By default, Fractal Domains uses red for the third region. On the following page we will discuss what you just did in a little more detail.